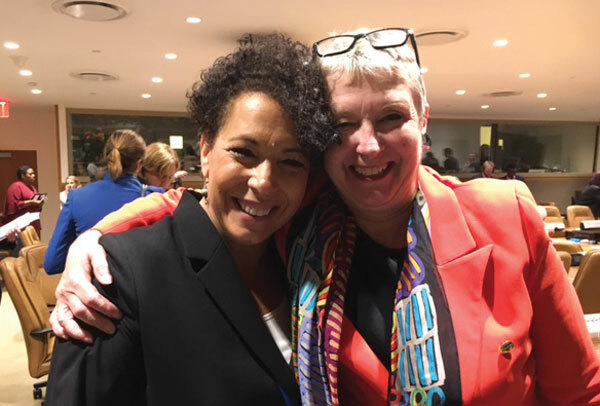 Michele Klein Solomon ’83 (left) and geography professor Ellen Kraly at a previous UN Summit on Refugees and Migrants in September. Michele Klein-Solomon ’83, a senior policy adviser at the United Nation’s International Organization for Migration (IOM), addressed a hearing of the U.N. General Assembly on July 26, in preparation for an upcoming international conference to adopt a global compact for safe, orderly, and regular migration. While the group talked about ways the U.N. can help address many of the negative drivers of migration, Klein-Solomon asked the group to ensure that efforts don’t impact the positive forces of beneficial migration. “What is the most effective way to help generate a more balanced discourse about migration and therefore more evidence-based policy making?” asked Klein-Solomon at a March 8 lecture in the Ho Science Center. She concluded by describing what she called the “governance challenge” — how to create better systems to ensure the safety and rights of migrants while also guaranteeing the security of states and ensuring that societies benefit from migration. Klein-Solomon received an honorary doctorate from Colgate at commencement. Prior to joining the IOM, she served as an attorney adviser with the U.S. Department of State.